Whether you need a quick replacement for that tire blowout you suffered on Highway 54 or you need your oil changed before a big trip, you do not want to waste time waiting until a service center can see you next week. 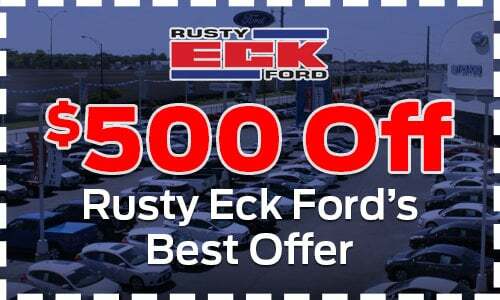 You can get your maintenance needs taken care of right now and without an appointment through Quick Lane at Rusty Eck Ford. Our factory-trained technicians keep your wheels in top shape with professional wheel alignments. We can also repair punctures and cuts while you wait. If you are looking for a good deal on a new set of tires from the best brand-names, drop on by anytime, but do not forget to check for any specials we have online. We also take care of essential car maintenance with no appointment necessary. Our Vehicle Checkup Report can pinpoint problems that need maintenance. We can then take care of any issues in-house, ranging from oil changes to servicing critical components like your transmission, suspension, and electrical system. Since no appointment is needed even for evening and weekend service, you can relax at our coffee bar while you wait. A wide-open view of the service bays lets you check out how we are doing with your vehicle. Do not be surprised to see us recycling your oil, vacuuming your interior, and washing the exterior. Ask about and register for our Owner Advantage Rewards program and receive an enrollment bonus of 5% credit on future visits and special oil change offers. Your Quick Lane service is backed by over 50 years of experience servicing the Wichita community. Although our highly experienced mechanics specialize in the Ford brand, we can take care of any make or model with the same commitment to quality and customer satisfaction. Check us out today to find out how we can improve your drive.